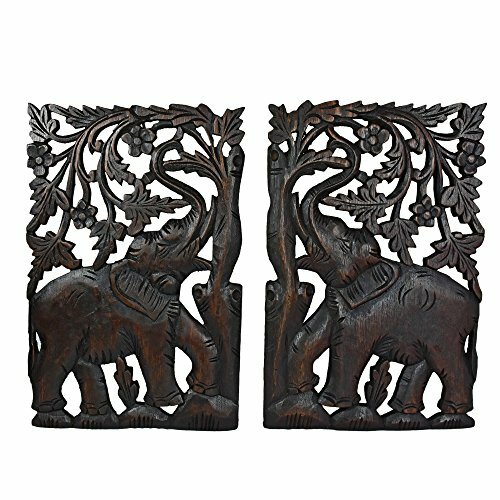 A pair of graceful elephant calves dance and hold their trunks high in this rectangular rain tree wood dual relief panel carving set of two. Artisan Khun Thanat from Thailand masterfully works with chisel and knife to achieve the fine detail of this eye catching relief carving. The deep wood tones and uniquely Thai inspired theme adds a spiritual flair to just about any wall. Each panel is 12 inches tall and 8 inches wide and the together they work beautifully upon bathroom walls, hallways, foyers and as small accent pieces above small tables. AeraVida is the leading supplier of Thai artwork and invites you to check out other products in this collection for additional sizes and styles. PLEASE NOTE: The handcrafted nature of this product will produce minor differences in design, sizing and weight. Variations will occur from piece to piece, measurements may vary slightly.